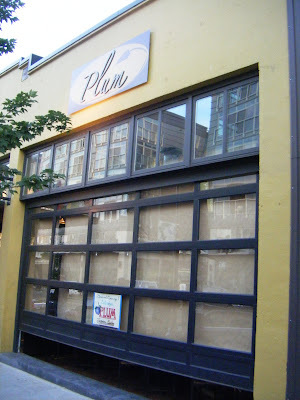 Plum — a new vegan restaurant, not quite open for business a week ago. Aha! I thought. So there’s that place my vegan buddy was carrying on about: the one with ties to Hillside Quickie. Plum, the latest addition to the Pike/Pine Triangle, had taken over the former Cafe Stellina space — right next door to La Spiga. Well, off we went to dinner. A couple tacos, some halibut ceviche and a margarita later, I looked across the street and saw some action at Plum. And when I poked my head under the garage door I found owner/chef Makini Howell sitting quietly and wearing a long face. “What’s the matter?” I asked, after sliding under and introducing myself. That’s when her very good friends Maikoiyo Alley-Barnes and Tilson piped up, telling me how their gal-pal was feeling extremely emotional on the eve of her “soft-opening” day. 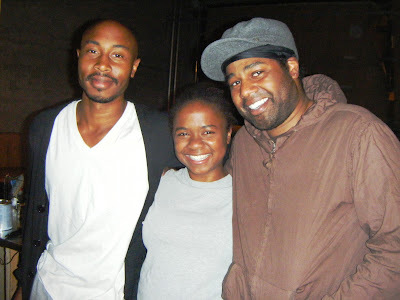 They explained that there was no one quite like Makini — whose many talents they were happy to trumpet. And no sooner did we get talking that a broad happy smile came over Makini’s pretty face. Maikoiyo and Tilson told me Plum’s owner is not just a great cook, she’s an all around extraordinary person — one who spent nearly a decade in New York (where she worked in the fashion world and ran a non-profit literacy program) before coming back to Seattle to open Hillside Quickie’s Cafe, one of three vegan eateries owned by family members. Makini and her siblings grew up without ever eating meat or animal by-products and the family has been in the business of selling vegan fare for 20 years. For them, veganism isn’t a hot trend, a social statement or a lifestyle change, it was the way their parents raised them. And now with Plum, Makini is hoping to raise the bar for vegan eats on Capitol Hill. The guys have been lending physical and emotional support, helping her make that transition (and, not incidentally, being well fed in the process) as we discussed Friday night. Plum has since made its debut as a 42-seat 100-percent vegan restaurant, but its grand opening isn’t scheduled till tomorrow (the liquor license is still pending). Meantime, there are other beverages to enjoy with your quinoa slider, seitan BBQ po’boy or spicy cajun mac ‘n yease with southern-fried seitan and gravy — among other offerings made with organic ingredients. You’ll find Plum at 1429 12th Avenue, serving breakfast, lunch and dinner.